Birthday parties only come around once a year, so indulging in sugary food might seem harmless. Yet there are many ways you can increase the healthiness of birthday treats without sacrificing taste. Healthier snack options give children nourishing treats, and parents will be grateful when they go home with kids who aren’t strung out on sugar or full of tummy complaints. 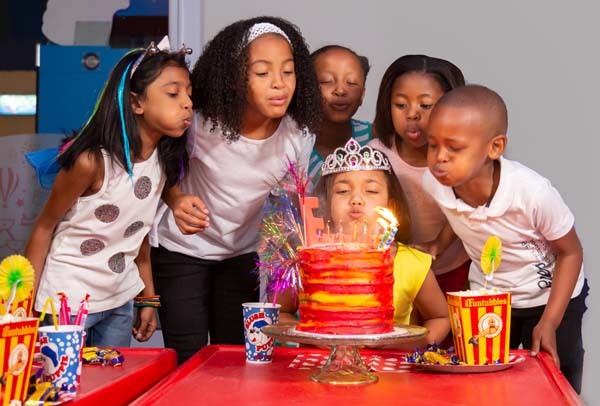 It’s not only kids who benefit from healthier birthday party food – health-focused mums and dads will also be grateful for birthday snacks that avoid the repercussions of unhealthy eating. Mini hamburgers – make healthy mince using lean meat of your choice and layer this with lettuce and tomato sauce on a long loaf of bread, then slice into squares and skewer each square for easy handling. Healthy mini pizza – instead of refined white flour, use whole-wheat pita pockets. Spread tomato sauce, sprinkle low-fat cheese, top with your favourite vegetables and bake. Sweet potato wedges – sweet potato wedges are a great healthy cheat – they’re sweet but full of nutrients. Low fat dips – serve low-fat tzatziki , aubergine dip or other dips with healthy accompaniments such as baked rice or rye crackers. Fruit kebabs – skewer mixed pieces of your favourite fruits – melon and strawberries make a good combination. Carob coated fruit and cookies – although it tastes different to chocolate, carob is a healthy substitute that guests at your healthy kids’ party will love when you serve it coating strawberries or low-sugar oat cookies.